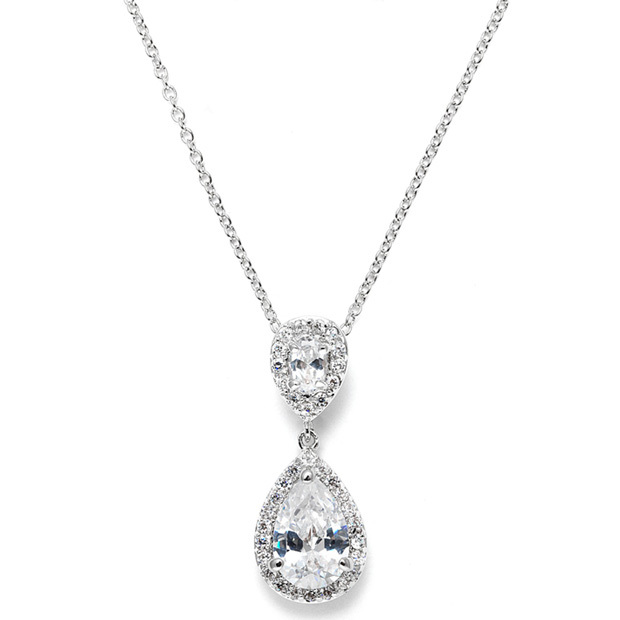 * Good things come in small packages and Mariell's exquisite double teardrop Cubic Zirconia pendant is no exception! * This Cubic Zirconia necklace has a 16" - 18" adjustable chain with a 1 1/4" h pendant. * Despite it's delicate size, this lustrous silver rhodium necklace is a glistening beauty. * It has an oval stone on top and a larger pearshape stone on bottom, both in a pave teardrop frame. * This beautiful pendant is a gorgeous wholesale bridal accessory and makes a splendid gift for bridesmaids or mothers of the bride. * There are matching earrings sold separately as 3520E.